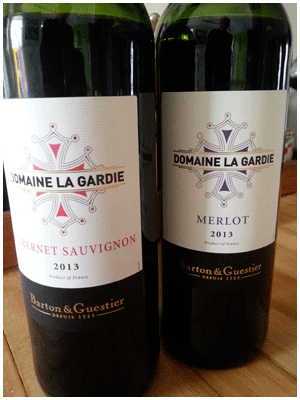 B&G’s Partager reds have been replaced by estate wines from the south of France. A smart move due to the shrinking demand for tired old brands. And the best part of the news is the much improved quality of the new wines. Both are excellent drinks for $9.95. Your parents will be impressed that you have finally come around to B&G, their favourite wine! The Merlot is medium-bodied, tangy-dry, fruity-earthy, with a house wine feeling. Very different from the rich, plummy/sweet Merlots from hot climates. Merlot fans may be better off buying the Cabernet which is the smoother of the two wines. It’s also medium-bodied and bordering on yummy. A party pleaser for sure. Lightly chill for the summer months.